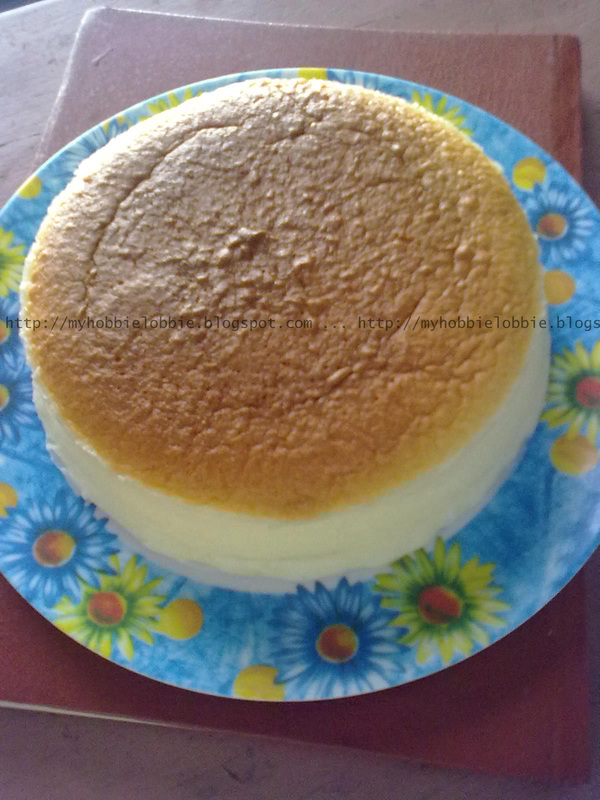 I'd read in a few places that this cheesecake is finicky and a lot can go wrong, but after making it, what I can say is that if you follow the instructions carefully, you will be treated to the most amazing cheesecake you've had in a while and that too, made right in your kitchen. I do hope you try this out. It would be such a shame to miss out on making this. And when you do, I;d love to know how it goes. Please excuse the picture quality, my camera was dead and I knew if I waited to charge it, there'd be nothing left to capture. So I just used my phone instead! Melt the cream cheese, butter and milk in a double boiler. Fold in the flour, cornflour, egg yolks, lemon juice and mix well. Whisk the egg whites with the cream of tartar till it is foamy. Add the sugar and continue to whisk till soft peaks form. Add the cream cheese mix to the egg white mix and mix well. Pour the mix into the prepared cake pan and bake it in a water bath at 160ºC for 1 hour and 10 minutes or until set and golden brown. Note: I halved the recipe and used a 6" round cake pan. We love cheesecake at my house. What makes this one Japanese? Alyssa, will link this up!!! Thanks for the invite! Julie, honestly, I have no idea. Thats whats its called so I just go with it! How delicious! I love a good cheesecake. I've never had Japanese Cheesecake, and as light as air too. It sounds amazing. Thanks Joy, you should try it if you have the chance! Looks great.. what cream cheese do u use for this? I am from Delhi so i need to do some searching..
Koolgirl, you can use Philadelphia Cream Cheese, they say its the best. I get a large tub(1kg) of cream cheese from a local vendor, since I have orders to cater to. Hello there trisha!Living in India means no cream cheese! What brand did you use...does britannia cream cheese work exactly as philidelphia.....i doubt it because britannia's cream cheese is way too tangy and salty.....so can. I use it to make a cheese cake....i read many indian cheese cake recipes using yogurt or cottage cheese....do they give exactly the same result?. Plz reply soooon!plzzzz! Arisha, I know exactly what you mean. I actually bought a tub of Britannia and ended up using it for a dip instead of the cheesecake. If you do try it let me know if it works. I used D'lecta. Using yogurt or cottage cheese will depend on the recipe you're using. I have made cheesecakes in the past using cottage cheese and they turned out just fine. Haven't tried it as a substitute for the Japanese cheesecake though. Hope this helps.